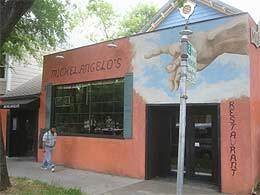 For my birthday, we shut down the office and got lunch at Michelangelo's on I street. We sat in the odd but comfortable patio in back. I had sure been eating a lot of meals outdoors in the last few days. That isn't what I meant by "eating out", but it is kinda turning out that way. 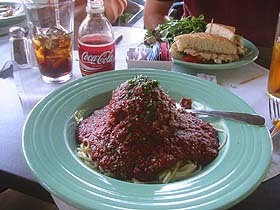 I got the infamous meatball with spaghetti. Yeah. Meatball, singular. Lunch was great, particularly because the boss was picking up the tab. My only complaint was that there wasn't water on the table, and my Coke was some pitiful 10 oz. size. My meal was $12.40 total. For my birthday dinner, Tom, Amy and Stacy took me out to one of my favorites, J.Lee on 25th and J Street. J.Lee is very elegant inside, with good prices, food and people. Curiously, this place is never busy. It is almost always quiet, even at 7pm on a Friday night. I've coined this empty restaurant syndrome. I think the majority of people, when they eat out, enjoy the hustle and flow of a busy restaurant. A bit like a dance club, I think they like feeling that they are where the action is. I ordered the chicken and penne pasta, with a beer. Dinner was $10.95, the beer was $4, tax 1.16 and tip $3.06 for a total of $19.17. As I write this, J.Lee is in the midst of a transformation. They are adding a sushi bar. I hope this works out well. I can't wait to try their new stuff and see if it attracts a bigger crowd. 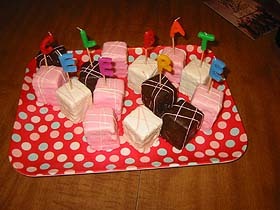 My birthday cake was an awesome collection of petit fours, from the brilliant mind of Stacy. Petit fours are little cakes, providing significantly more surface area for icing. Instead of feeling that deflated "day after my birthday" feeling on Friday, I was jumping out of my skin because I had the day off and was going skiing. This was my first time skiing. 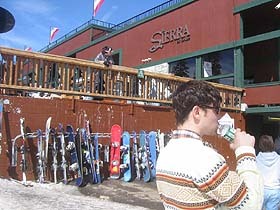 We went to Sierra at Tahoe. The weather was clear and warm. Here is Mark skiing the Nordic Combined event. It was a little ugly to start with, of course, but I caught on fairly quickly and started having fun. I actually expected it to be harder. I guess I'd heard a lot of horror stories growing up. Skiing is an incredible experience, but it isn't cheap. A critic would say you are paying $49 for six rides up a hill. We ate a late lunch at the Grand View Grill at the top of the mountain. 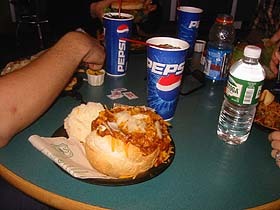 I had been advised to avoid the yellow snowcones, so I had the chili-filled bread bowl and a Pepsi. It was $10.13. This lodge reminded me of a snack bar at a roller rink. It had super-tough carpet and the heavy smell of well-exercised visitors. One difference was that the staff had interesting accents, revealing their distant origins. I only fell down three times. Here one fall is re-enacted. 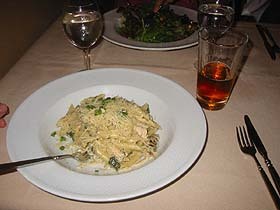 Dinner was Italian food at Passaretti's in South Lake Tahoe. This was a friendly place. The front window had a neon sign indicating "Tables Available". I'd never seen that, but it makes a lot of sense, like a "vacancy" sign on a hotel. The soundtrack for dinner was created by two busboys clearing 80 settings in the banquet room. 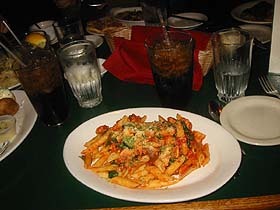 I ordered the Joe Penne, which included soup and salad. The pasta was perfect. My total for dinner was $16.96. That night, my guts were assaulted. I suspect that some ingredient in the chili bowl lunch had contained tiny intestinal terrorists, who were attacking my small and large intestines with picks, mace and water cannons. 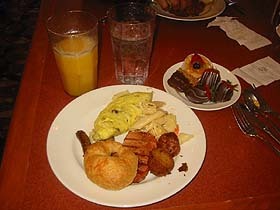 The next morning, Saturday morning, we visited the Forest Buffet at Harrah's Tahoe. 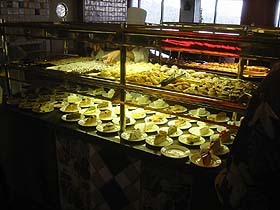 For $13.95 we had our pick of dozens of breakfast foods, as well as Chinese food, pizza and an impressive dessert case. Nothing was particularly good.. no, I take that back, the lemon tarts were very good, and the sausage were also good. I'd never eaten those two together before. I learned two things Saturday: Sledding is a hell of a lot cheaper than skiing, and you can't wage a snowball fight if you don't have gloves. 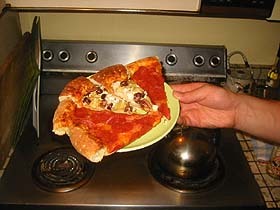 For dinner we ordered pizza. My share was $5.40. Please continue reading March 21st.